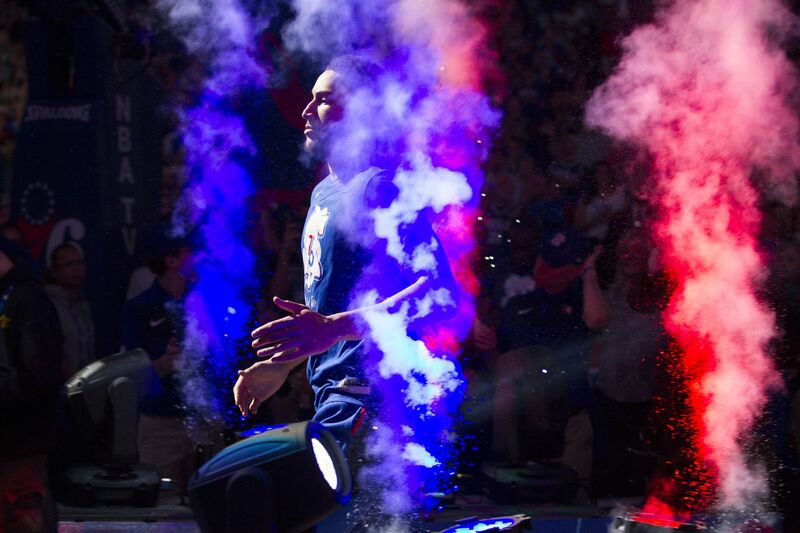 Ben Simmons of the Sixers is introduced as aprt of the starting lineup against the Nets during their NBA playoff game at the Wells Fargo Center on April 13, 2019. There was a lot of talk about defense after this one, and that was perfectly understandable. The Sixers’ 111-102 loss to the Nets on Saturday featured way too many moments when a Brooklyn ballhandler seemed to be toying with the defender who was -- ostensibly, at least -- in front of him. Spencer Dinwiddie, Caris LeVert, D’Angelo Russell: it didn’t matter who had the ball, the Nets found a way to get him isolated on a favorable defensive matchup. If that doesn’t change, this series is going to feature a lot more games like the first one, and that deep playoff run the Sixers have talked so much about will instead culminate in one of the biggest postseason disappointments in this city’s history. D’Angelo Russell, center, of the Nets shoots over TJ McConnel, left, and Boban Marjannovic during the 2nd half of their NBA playoff game at the Wells Fargo Center on April 13, 2019. So, yes. The defense must be better. It must be much better. And Brett Brown must find a way to make that happen with a hobbled rim protector and a rotation with precious few legitimate two-way players. It won’t be an easy job, but it’s his and his alone to do. But none of that is the principal reason for the unsettling feeling that should have overcome any Sixers fan -- or general manager, or owner -- who entered the day entertaining visions of the Eastern Conference finals or beyond. We’ve long known that this rotation wasn’t going to arrive in the playoffs and suddenly transform into the Maginot Line. We’ve long known that, with a trio of quick-off-the-dribble guards, the Nets feature an abundant stockpile of the Sixers’ kryptonite. Of the eight regular-season games that these two teams have played over the last two years, five have seen Brooklyn score at least 116 points, including 122, 125, and 127 this season. While it never looks any prettier, the fact remains that the 93 points the Nets scored in the first three quarters on Saturday put them on a pace that was similar to those previous outings. No, the disconcerting thing about this Game 1 loss was that those defensive struggles came paired with an offense that spent 48 minutes tripping over itself whenever Jimmy Butler or Joel Embiid did not have the weight of three or four other players on his shoulders. Butler’s ability to thrive in that situation was the only reason the contest was even marginally competitive after three quarters. You can spend however long you want squinting into the wreckage of this one, the 36 points and nine rebounds and tenacious on-the-ball defense that the Sixers got from their free-agent-to-be are the only silver linings you’ll find. If everything else had remained even, Butler’s performance would be a significant reason to think that this playoff run has a better-than-expected shot to extend past the second round. Joel Embiid of the Sixers waits to enter the game at the scorerâ€™s table with a heating pad on his knee during the 1st half of their NBA playoff game against the Nets at the Wells Fargo Center on April 13, 2019. “A big part of our game plan was shutting those guys down,” Nets coach Kenny Atkinson said. It’s a strategy that becomes a lot easier to execute when one team has the benefit of guarding another with five men against four. And therein lies the conundrum that Brown and his coaching staff confront heading into Game 2. Ben Simmons, the All-Star, the cornerstone, the point guard, was the team’s biggest problem. Not just because of his individual performance -- he finished with nine points and four assists and struggled to keep ballhandlers in front of him on defense -- but because of the way his mere presence impacted others. Whenever Simmons was more than 8-to-10 feet from the basket, the Nets essentially ignored him, dropping any defender in the vicinity down into the paint. There was a moment in the first half when Simmons’ presence on the baseline 15 feet from the basket allowed Jared Dudley to double-team Harris, and that paled in comparison to a pivotal late-game possession when Simmons had the ball on the elbow with his back to the basket and, rather than looking to score, tried to hit a cutting Redick. With Simmons thinking pass all the way, Brooklyn forward Treveon Graham sagged off him to a point that Redick was essentially double-teamed. Graham easily plucked the pass off the bounce for one more nail in the coffin. “Maybe there are some things that we can do to better sort of utilize him given the way people defend him,” Brown said. But is there even any figuring that can be done? There were stretches during the game when the Sixers used Simmons in the pick-and-roll as a screen setter, but that comes at a cost. The simple answer is that Simmons needs to play better. If he isn’t going to shoot the ball -- and, afterward, Brown came as close as he ever does to saying he wished that would happen -- he needs to find some other way to force the Nets to account for him. If that doesn’t happen, the playoffs are going to end with the Sixers well short of expectations.